VATICAN CITY (CNS) — When it comes time for young people to make an important decision in life, if the possibilities do not create excitement and trepidation, “it’s better to go to bed” and think about it some other time, Pope Francis told middle school and high school students. “Passion in the life of a young person is important. 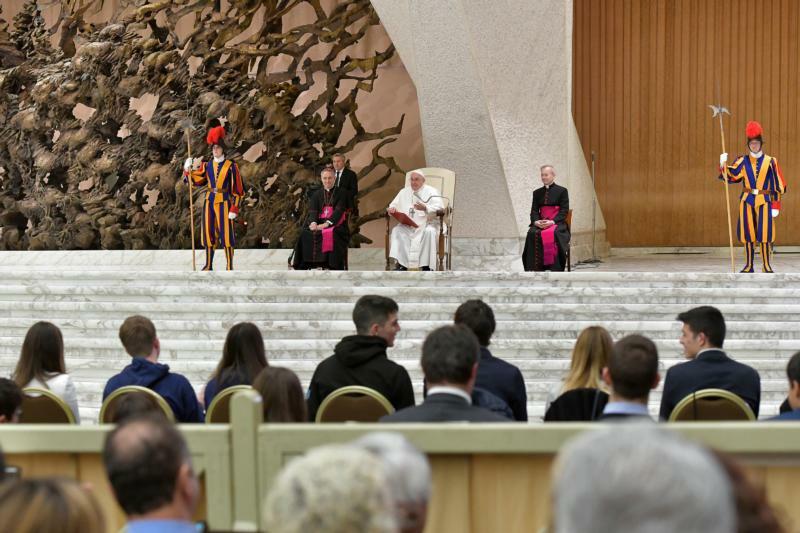 A life without passion is like plain pasta without salt,” the pope said March 23 during a meeting at the Vatican with students and staff from the Barbarigo Institute school in Padua. Three students were chosen to ask Pope Francis questions, and all three queries had to do with making important choices in life. In responding, the pope told the young people that prayer, dialogue, enthusiasm and service to others are key to making the right choices about what school to attend, what career to pursue and what vocation God is calling them to. “You will find the most important point of reference for your choices inside yourself; it is the reference of your own conscience,” which becomes clearer through prayer, the pope said. Authentic education, he said, prepares students for their vocation and their adult life in the world by giving them information and teaching them to think, but also by helping them recognize how the reality around them makes them feel and by showing them the action they can take to help others. “Intellect is valid and necessary, but it is only one of the languages that you must have,” Pope Francis said. The others are having a heart capable of feeling and hands able to provide concrete help. The students serve at a soup kitchen in Padua, an experience Pope Francis told them was an important part of their education because it helps them “draw close to a problem that is real, not theoretical.” The experience, he said, should make the students question why they are so fortunate and what they can do to fight hunger. And, as far as figuring out vocations and careers, Pope Francis said talking to God in prayer — “not like parrots, ‘blah, blah, blah,’ but from the heart” — is essential.